Two-time champions Kolkata Knight Riders (KKR) are one of the formidable sides in the Indian Premier League (IPL). The Kolkata-based franchise has won the IPL in 2012 and 2014. besides, Knight Riders in previous three seasons have made it to the playoffs. However, a place in the finals has eluded them. Dinesh Karthik was last season named as KKR’s new captain replacing two-time winner Gautam Gambhir. KKR fans will be hoping that Karthik leads their favourite team to tile win. Meanwhile, if you are a KKR fan and want to watch online live streaming of their matches, then you have landed on the right page. Below we have listed all the information on how to watch live streaming of IPL 2019 KKR matches. KKR Squad in IPL 2019: Team Profile, Schedule of Kolkata Knight Riders in VIVO Indian Premier League 12. Kolkata Knight Riders open their IPL 2019 campaign against last year’s runners-up Sunrisers Hyderabad (SRH) at home, which is Eden Gardens in Kolkata, on March 24. Interestingly, Knight Riders first two matches are home games. KKR’s first away fixture of the IPL 2019 season is against Delhi Capitals on March 30. 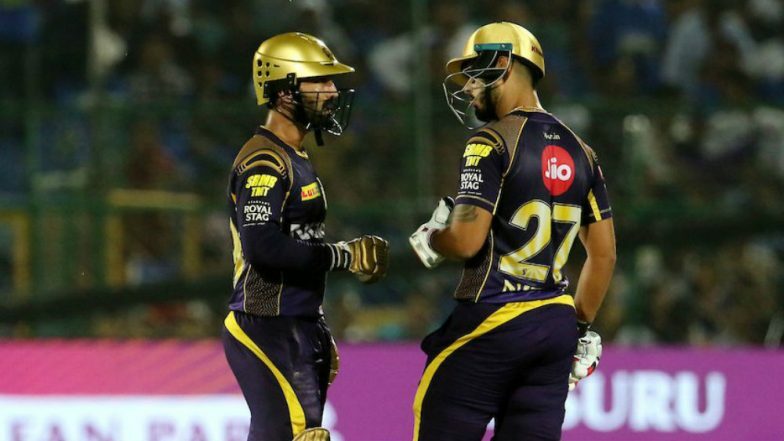 Team KKR New Players: Here’s a Look at Upcoming Talent in Kolkata Knight Riders Squad for IPL 2019. KKR’s league stage will come to an end on May 05 with an away game against three-time champions Mumbai Indians (MI). It will be the last league-stage game of the IPL 2019. As per KKR’s IPL 2019 schedule, the DK-led side will be playing four away matches on the trot from March 30 to April 09. Kolkata Knight Riders Tickets for IPL 2019 Online: Price, Match Dates and Home Game Details of KKR in Indian Premier League 12. Star Sports Network holds the official broadcasting rights of IPL 2019. So, its OTT (Over the top) platform, Hotstar, will live stream the IPL matches. For IPL 2019 live score, points table and schedule, KKR fans can click here. KKR fans can catch the live action on hotstar’s mobile application and official website. JIO users can watch IPL matches for free on their devices via hotstar app.